ACTinBOX QUATRO Multifunction Actuator 4Out 16A C-Load. Multifunction Actuator 4Out 16A C-Load. Multifunction actuator. 4 x 16A outputs, C-Load. 2 DIN rail units. 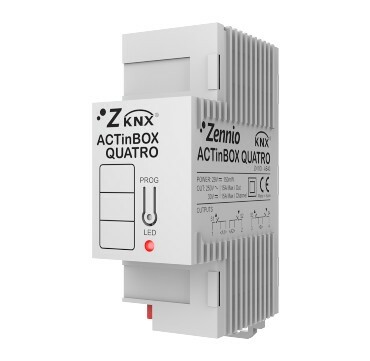 ACTinBOX QUATRO is a multifunction actuator with 4 outputs suitable for capacitive loads. It includes advanced logical functions that provide it with a large variety of different configuration possibilities.